A miniature tree look-alike of the vegetable world, broccoli is famous for its nutritional profile and amazing health benefits. The vegetable is a member of the Brassica oleraceea species, alongside cabbage, cauliflower, kale and Brussels sprouts. It is highly appreciated for its uniquely crisp texture and green taste as well as for its excellent antioxidant content, aiding in the prevention of chronic diseases. The antioxidant phytochemicals found in broccoli counteract the damaging oxidative effects of free radicals and protect us from a wide range of chronic, life-threatening diseases such as cancer, cardiovascular disease and even premature aging. You could say that the vegetable’s resemblance to a tree and its beautiful, intense green colour hint to its incredible life-sustaining properties. Although it is low in calories (only 34 kcal/100 g), broccoli is rich in dietary fiber, antioxidants, minerals and vitamins. Freshly harvested broccoli are especially healthy because they have incredibly higher quantities of potent phytochemicals such as thyocyanates, isothiocyanates, indoles, sulforaphane and powerful flavonoids such as beta-carotene, lutein, zeaxanthin and cryptoaxanthin. Basically, phytochemicals are natural substances with amazing antioxidant properties which combat the harmful effects of free radicals. The latter have been linked to a number of chronic, life-threatening diseases. Fortunately, it has been shown that the consumption of foods rich in antioxidants, such as broccoli, efficiently counteracts free radical effects. Beta-carotene, cryptoaxanthin, lutein and zeaxanthin are all converted into retinol or vitamin A and are prerequisites for a perfect vision. Even more, the phytochemicals found in broccoli are shown to efficiently protect the bladder, colon and pancreas, among others, from damage to cells DNA as well as initiate repair of existent cell damage. Very important, broccoli has a high content of vitamin C, a potent antioxidant, anti-inflammatory and antimicrobial. Actually, 100 g of fresh broccoli provide us with 50% more vitamin C required to meet our daily allowance. This is important because vitamin C is essential for numerous body functions such as, for example, synthesizing collagen, the main structural protein that maintains the integrity of our blood vessels, skin, internal organs and bones. Not amazed yet? You will be when you find out that collagen is what keeps our skin tight and youthful. Regular consumption of the vegetable helps prevent scurvy, a disease caused by a serious vitamin C deficiency. In addition to this, broccoli provide us with significant amounts of vitamin A, required for healthy mucous membranes and a perfect vision. Studies show that vitamin A is incredibly efficient in preventing macular degeneration (or loss of central vision) in the elderly. 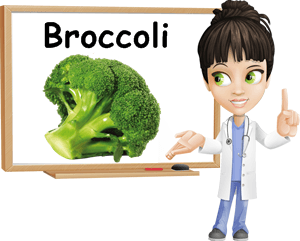 Other important vitamins found in generous amounts in broccoli include vitamin K, famous for sustaining overall health due to its participation in numerous crucial body functions such as blood coagulation. Broccoli contributes to overall health thanks to its B-group vitamin content. Folate, pantothenic acid and pyridoxine are all B-group vitamins which efficiently contribute to general health. Very important: broccoli is one of the very few members of the vegetable world which supply Omega-3 fatty acids. Although they come from a plant source (and thus are different from those from fish), Omega-3 fatty acids are great allies of cardiovascular health, reducing stroke and coronary heart disease risks. Additionally, broccoli has small amounts of all the important minerals. Potassium, calcium, copper, iron, magnesium, manganese, selenium and zinc all contribute immensely to our health. Selenium, for instance, is known for its potent anticancer effects, while zinc helps strengthen our immune system. Overall, broccoli is an incredibly healthy vegetable, with unparallel anticancer properties, provided it is consumed either fresh or slightly cooked. Basically, if you want to fully enjoy its amazing properties and health benefits, you should eat it either raw or steamed, even stir fried. The key is to reduce the amount of time it is cooked to better preserve its essential nutrients. If you are interested in growing your own broccoli (which is probably best), you should know that it requires a rich and well-drained soil and a not too hot climate. Moreover, depending on the variety, the head may vary in colour from a beautiful, dark green to purple. Both the stem and the head are edible and broccoli heads may vary from 10 to 20 cm in diameter. It is recommended to harvest broccoli before its flowers bloom yellow. I fell in love with this vegetable from the first bite. My favorite broccoli dish is a simple recipe made from a steamed broccoli head to which I add 2 spoons of sour cream and one smashed garlic clove. The combination is delicious and healthy. How do you enjoy your broccoli?